This is another intriguing project. 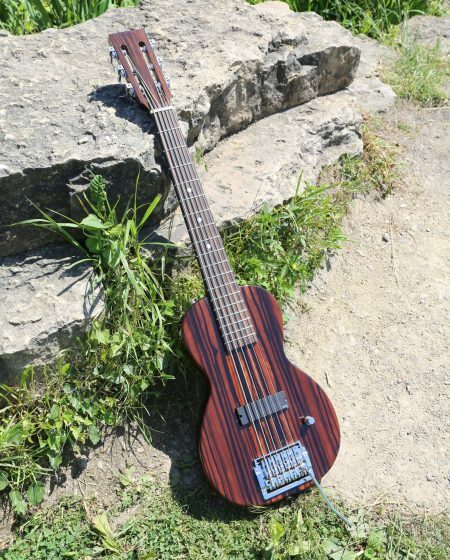 Its body is a slab, J-bass style design made out of basswood. 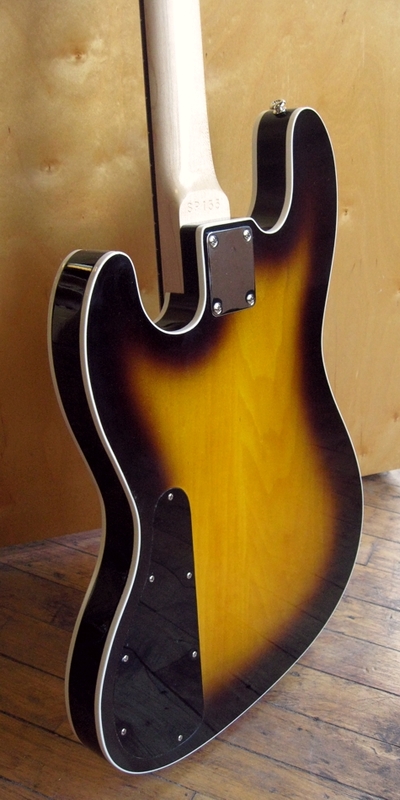 The neck is made from quarter-sawn rock maple with an ebony fretboard and its dimensions are those of a Rickenbacker. 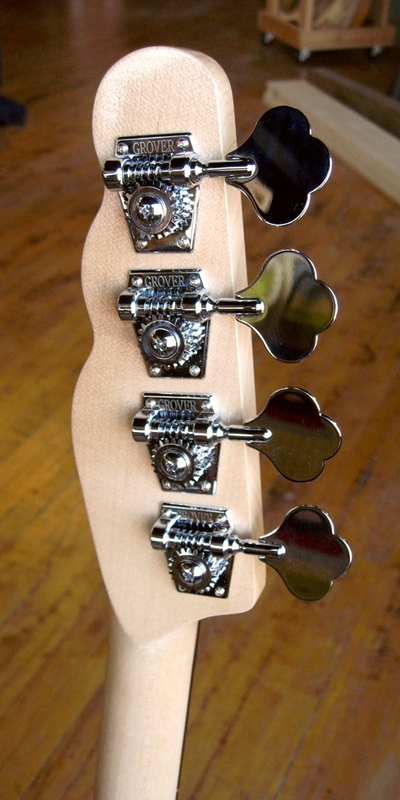 It also has the requisite volute of a Rickenbacker. It features Specimen’s customary non-adjustable steel reinforcement in the neck to yield the finest absolute tone. This instrument has a very nice weight, fairly light, having just the right interplay with the Dimarzio Ultra-Jazz humbucking pickups. 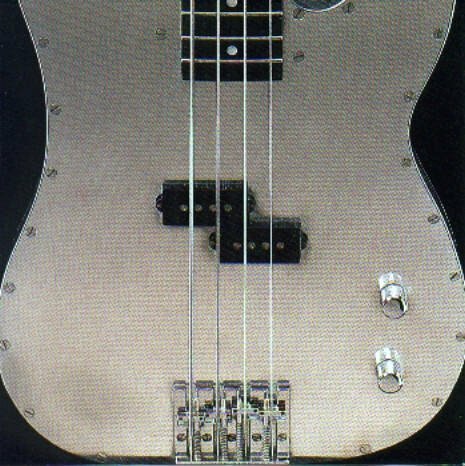 One thing that has always bugged me about the Jazz Bass format is that the single-coil pickups always seem so stark sounding by themselves, and they can be noisy upon occasion. The Dimarzio pickups solve this and fatten up the sound a bit. 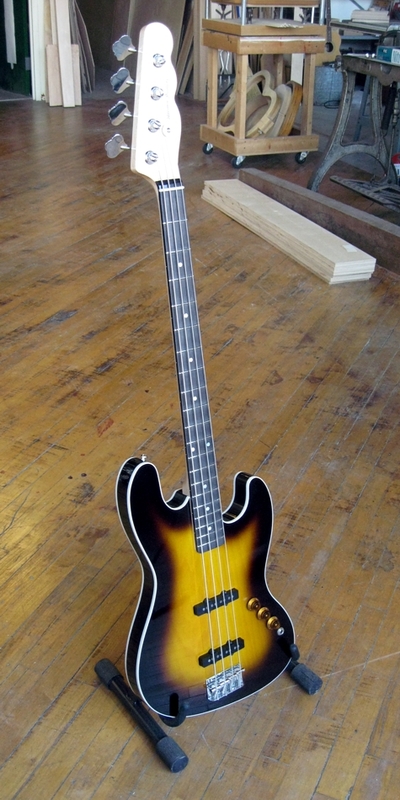 The body has a Gibson feel with the traditional dark walnut over amber sunburst with white binding, but with a Jazz Bass silhouette. 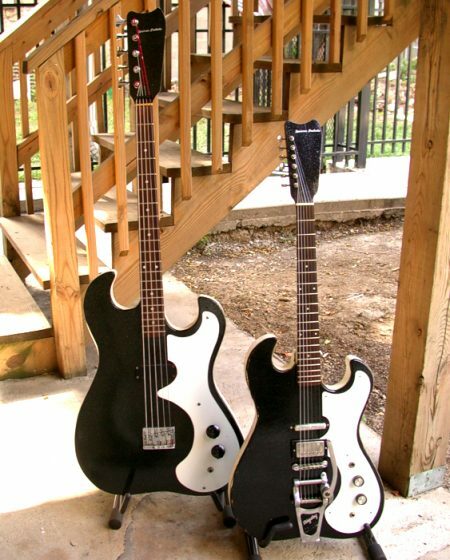 Paired with the Rickenbacker-esque shaped neck, we have a true hybridization on what, at first glance, looks like a rather unassuming instrument. 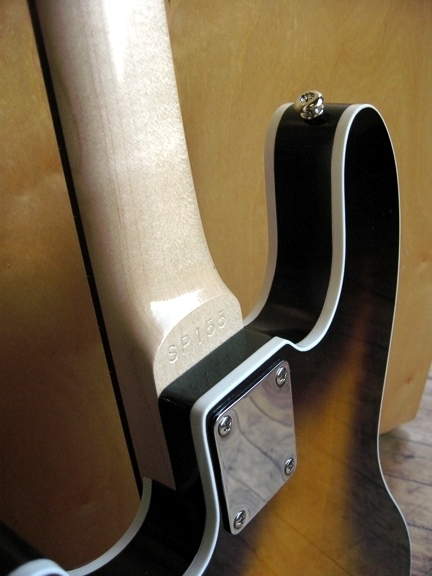 This is truly a great example of the sonic benefits of the NON-adjustable steel truss rod. 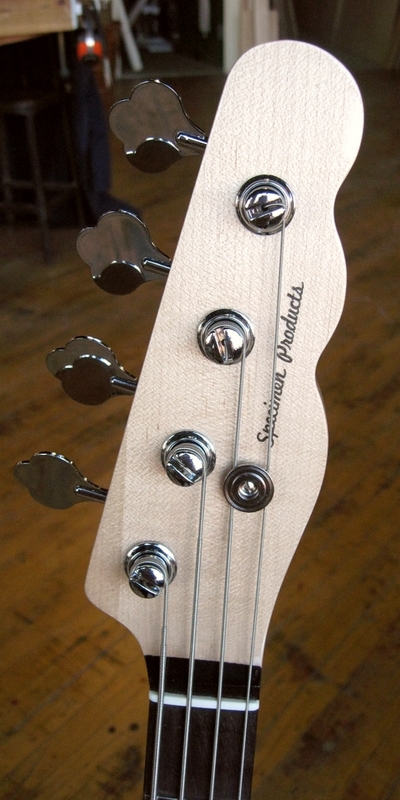 You can hear things that are simply missing in the “traditional” adjustable truss rod format. 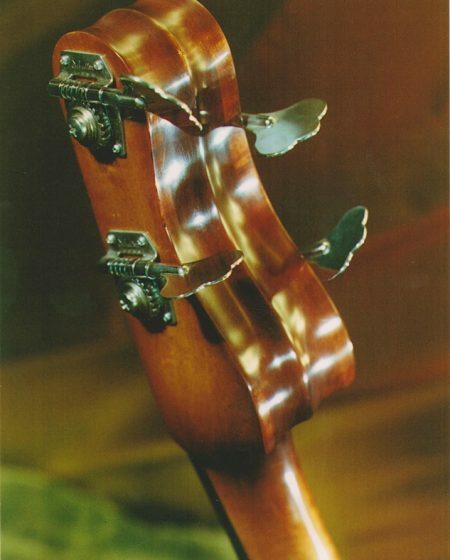 When making a non-adjustable neck, it must be carefully crafted to the correct tensile strength and shape to yield the proper amount of neck relief for the gauge and tuning of the strings to be used. 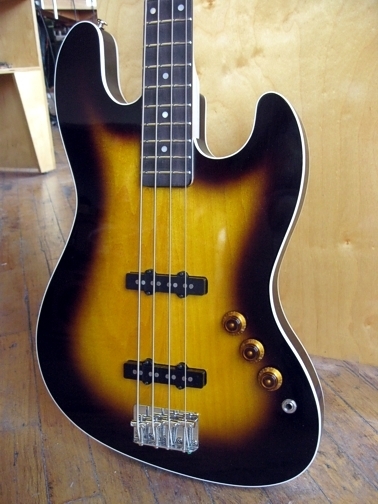 This issue is even more critical with a bass and takes additional time and effort. This is why the “Industry” cops out on the issue and installs nasty sounding adjustable truss rods. There, I’ve said it.